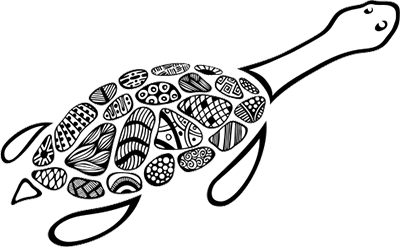 The Yelakitj Moort Nyungar Association are proud to present the Booyi Cultural Program, an exciting interactive educational program that celebrates the understanding and appreciation of Aboriginal and Torres Strait Islander histories and cultures. The Booyi Cultural Program is an inspiring package that offers a variety of exciting hands-on activities, including interactive nature walks, bush tucker workshops, cultural history lessons, dream time storytelling and Welcome to Country and smoking ceremonies. Cost: Prices vary depending on the number of activities and group size. Contact us for a quote now. The Booyi Cultural Program can offer exciting excursion experiences where students can embark on a journey through the bushland and wetland areas along the Djarlgaroo (Canning River) and discover the traditional practices of the Nyungar people and their connection to the land. Students learn about native animals and the practical uses of native plants. Stories from local Aboriginal Elders will further illuminate an understanding of Indigenous history and the impacts of colonisation and settlement on local communities. Interested in a learning about a location near you or have your own bushland/wetland patch on your school property? We can do an excursion to your chosen place, contact us to find out more! The Booyi Cultural Program can conveniently come to your classroom or location and present the many different activities that we have on offer. Incursions can be tailored to your individual class/group or a whole school event. Click the button below to view different activities we have on offer. Learn how to build a Mia Mia (traditional shelter) using local materials. Learn how Nyungar people collected the different materials and how they used them for making the Mia Mia. Learn about bush tucker and medicine including the traditional uses of the Zamia and Balga. Cooked bush tucker (kangaroo) and damper making is available at an extra cost. When booking, please indicate if you would like one of these optional extras. Learn where ochre comes from and how it is used to create indigenous art. Learn the different art symbols used by Nyungars and what they mean. Choose from hand print painting, face painting, rock art, message stick or chalk paint art. Learn about traditional tools that were used for hunting and gathering. Learn how to throw spears and use message sticks. You can also make a Kodja (traditional stone tool) . *This is available for Year 4 students and older. Learn the art of aboriginal dance and how animals are incorporated into these dances. Learn about the history of the Nyungar people through the sharing of dream time stories. Resource display of traditional materials (eg. animal skins, artefacts, tools, clothing and bush foods) where the students can touch, use and explore their uses. Walk and talk through the Djarlgaroo (Canning River) area learning about the birds, animals, plants and how the Nyungar people connected with the land. *Excursion location: contact us for more information. A welcome to country ceremony is a traditional Aboriginal blessing, symbolising the traditional owners’ consent to an event taking place on their land. We offer Welcome to Country, contact us for more information. Let the smells and sights foster the harmony of the Nyungar culture. To find out more, contact us. Contact us and we can accommodate your needs. Corporate group/team building bookings are welcome. ‘Booyi’ is Nyungar for Long-Necked turtle! Long-Necked turtles are a significant indicator that our waterways and rivers are healthy. 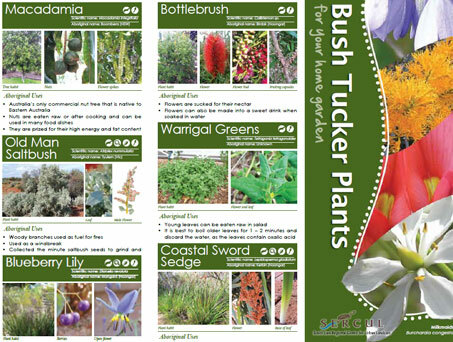 Fact sheets and brochures about common (and not so common) Bush Tucker plants that can be grown in the Perth region. 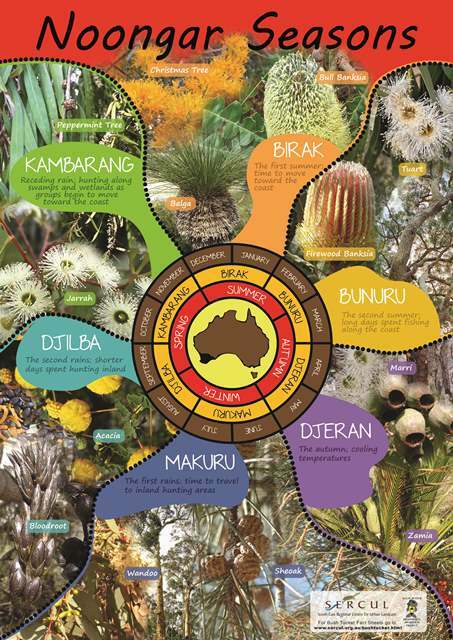 A2 poster featuring the 6 Noongar seasons – Birak (December, January), Bunuru (February, March), Djeran (April, May), Makuru (June, July), Djilba (August, September) and Kambarang (October, November). Available to purchase through SERCUL.